The Dodge Challenger is one of the oldest brand names made by the company. The vehicle’s origins date back to the 1970's. It is obviously a bit difficult to buy a used Dodge Challenger that goes back to that year, and it may be quite costly too as it is considered a classic car. However, you may be pleased to note that a newer version of the Dodge Challenger was re-launched in the automobile market in 2008. This was classified as the third generation of this model. This 2-door coupe comes with a 4 or 5-speed automatic transmission, or a 6-speed manual transmission. 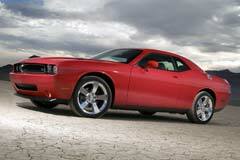 In 2011 the Dodge Challenger also got new engines so as to further improve on its performance ratings. Other modifications were introduced as well, especially with the most recent model. It has been marketed as being an iconic muscle car that was offered at low prices.